Was the original title for this blog, a cheap innuendo based around avenging last year’s sprint-finish defeat by Team GB’s Jack Wood, by pipping him high on the misty upper-slopes of Mount Sniezka in this latest edition of the World Champs. 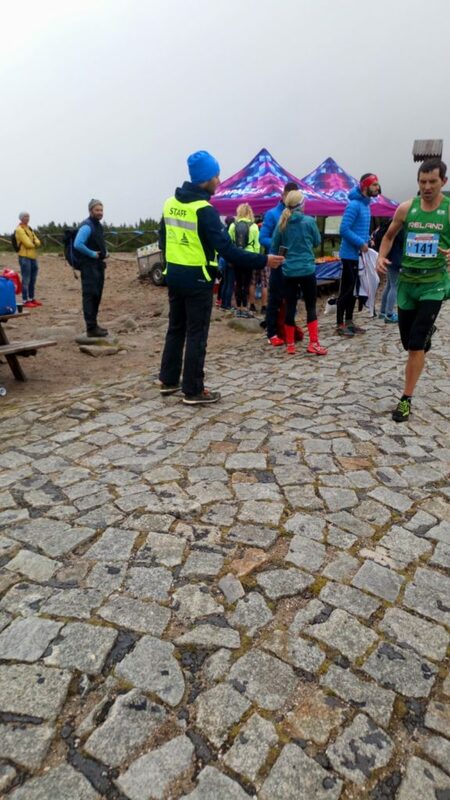 But although many careers have been forged on puerile humour, it’s a poor way to encapsulate the suffering, drama and satisfaction of being part of the premier event in the mountain running calendar, particularly when Jack is young, fast and will have his revenge many times over. And so instead, something more serious will form the real basis for these musings, the cruelty of the ageing process and the impact on the mind. I’ve never really been one to get hung up on age, it definitely is just a number, but unfortunately attached to the stockpiling of ever-increasing days, months and years is a separate unstoppable force, the gradual deterioration of mental and physical prowess. For many people this can be dealt with pragmatically, an acceptance of fact as the requirement to pee twice a night becomes a new norm amongst many other symptoms! For athletes though there can be an additional cruelty, as we’re inevitably attuned to the micro-nuances of our bodily abilities, alongside often carefully documented records of previous performance. Whilst the vast majority of humans never get anywhere near their capabilities, we live to find the outer-reaches, always seeking that intangible ‘peak’ and then painstakingly attempting to re-find it once it’s supposedly been discovered. Most of us seem aware that we will ultimately degenerate but, as with our own mortality, humankind is very adept at sweeping this reality to the back of our minds, something to worry about way down the line, until one day that line is crossed and we shuffle off to wherever may be next. What we appear less prepared for is the little-mentioned impact of ‘societal ageing’, the process whereby Western culture worships the elixir of youth at the expense of prior generations, devaluing experience and rendering the older populations increasingly irrelevant. In my experience so far, this is the harder aspect to deal with, the realisation that personal ‘relevance’ is being challenged, the true underlying basis of the ‘mid-life crisis’. I reckon most men (and probably women although I can’t speak from experience) will suffer the symptoms of this societal ageing at some point, described very well by a friend as becoming gradually more ‘invisible’. I remember watching the World Cup at least eight years ago and suddenly realising that every single player was younger than me, and so my professional football career would almost certainly never get off the ground. As daft as that sounds, it’s an example of the first time I became aware that there were ambitions in life that simply wouldn’t happen, and that as I age this list will grow exponentially. From that first stark realisation, I was suddenly able to plot a direct line to the grave, as the youthful shield of invincibility slipped, revealing the underlying fact that I can’t be around forever. So where the hell is this all going? Well, as ever, I kept a close eye on the running fixtures for 2018 as they were released last year, plotting dates in the diary and formulating ambitions. I was amused and also deeply inspired to see that the Worlds, always my primary focus, fell on June 24th, just two days after my fortieth birthday. Even better, that meant that the travelling for the event would inevitably fall on the actual day. That particular birthday traditionally possesses some kind of additional gravitas, as if you’re suddenly passing into a new chapter, countered by the glib ‘life-begins’ tagline. I loved the idea that with the right preparation there was a chance that I’d commence that transformational decade by being allowed to compete against, and hopefully amongst the best athletes on the planet. And so it transpired. A slightly lacklustre performance at the sixteen-mile qualifying race over some lumpy parts of Wicklow saw me come in second, three minutes inside the 1:50 qualifying time. Following that, I managed to put in a great run at the Three Peaks, scooping the Jack Bloor ‘best newcomer’ prize and dipping inside the top-ten despite a total unfamiliarity with the course. The final six weeks coming up to the Worlds were suitably tough and reaped heartening rewards including a huge new 3:41:11 FKT for the Mourne Skyline and taking four minutes off an already fast eleven-mile trail testpiece time. Confidence was quietly high, and for once I was managing to head away unhindered by personal ambition and expectation, maybe the result of previous experience racing at this level. Travelling on my fortieth did turn out as fun as expected and I must admit to enjoying the prospect of commencing my new decade with something as prestigious as representing internationally in my chosen sport. Gathering at a roasting Dublin airport with teammate Des and management team Jeff and Niamh, we began the pretty epic but smooth journey to Karpacz, Poland where Eoin, our third team-member was already settling into the hotel, WhatsApping images of his immense dinner. 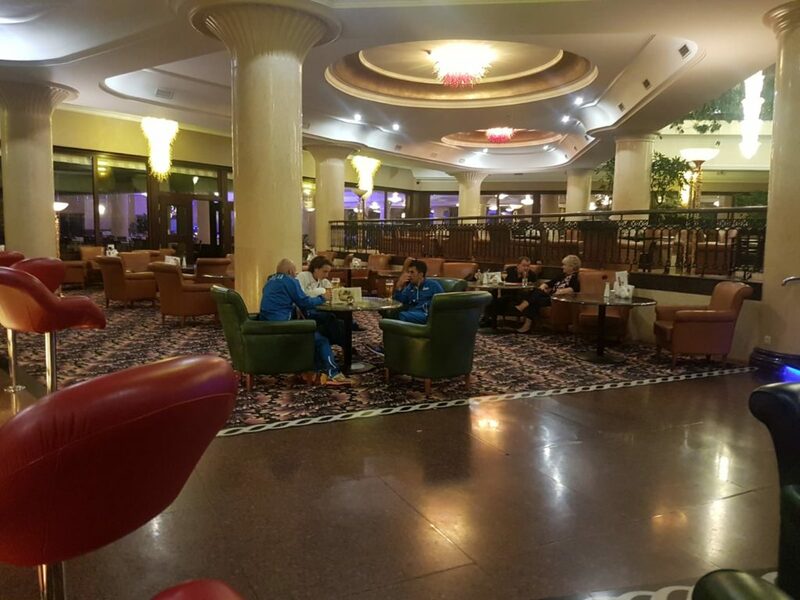 Teams are often dispersed due to the number of athletes and support crew but happily on this occasion we were all based at the gargantuan Hotel Golebiewski, reputedly Poland’s largest. Certainly the aircraft hangar sized reception, huge fish tank replete with proper ‘River Monsters’ style catfish, two nightclubs, four restaurants, 850 rooms and sizeable swimming pool complex indicated that the hotel could manage to house and feed us all, although we did have a slightly bizarre half-hour wait for our room keys despite arriving after midnight. Sometimes you just have to shrug and accept, and in their defence, inside my also sizeable room was a classic European platter of breads, smoked cheeses and suspicious cured meats, not the best 2am snack for a mountain runner but I couldn’t resist ploughing in. About a hundredth of the MASSIVE foyer! The gluttony could easily have continued in the morning at the most comprehensive buffet I’ve ever witnessed, with the magnetic draw of at least ten different cake options alongside every other conceivable breakfast type. It was amusing to see the variations in fuelling tactics amongst endurance athletes of different nations, with some of the most waif-like actually being the ones who succumbed to the sugary treats. I kept it sensible, refusing to alter eating habits so near to the event but thoughts and conversations centred on the damage we’d do to this spread the day after the race. The buzz around the hotel was great, corridors filled with skinny people in matching team kits, and we whiled away the Saturday chatting with friends and acquaintances both old and new. A short jog into town gave us a feel for the lay of the land and also a good view to the distant peak we’d be ascending twice the next day. The often cringe-worthy ordeal of the opening ceremony was definitely the most entertaining I’ve attended, featuring the runners-up from Poland’s Got Talent 2012 (or something like that, they were actually a pretty impressive pair of gymnasts). The band who came on afterwards were actually really good but the lead singer was always on a loser trying to get a bunch of self-conscious runners to get up and party when all we really wanted was to slink off for an early bed. If only they’d have played the closing ceremony instead! And so to race day. I’ve been blighted on my three previous World Champs appearances by environmental conditions, from the altitude on Pikes Peak in 2014, to searing heat in Slovenia in 2016 and crushing humidity at the Giir Di Mont last year. This time, the forecast looked more suitable to us Irish folk with potential for sub-zero summit temperatures, light rain and poor visibility, perfect for a 22 mile mountain run. 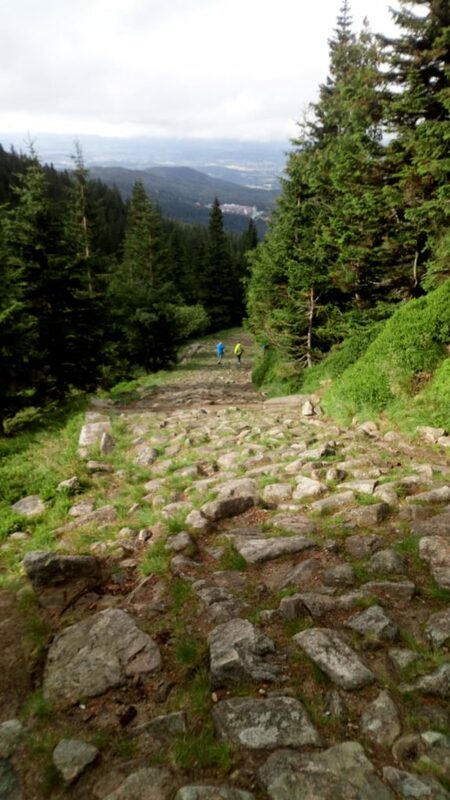 The course took us from the town centre, up through wide forest tracks to steeper stepped sections and then an epic cobbled road for the last couple of miles to the summit before plunging back down on more cobbles, semi-tech and then high speed smooth trail and road. Passing through the start/finish area, we then ascended the same peak via a different route but descended the same one, allowing a useful but soul-destroying familiarity. I’d promised myself that for the first time ever I’d start without fear, pushing the early pace with the leaders, if only to know how quick I’d need to be to win. As it turned out, the first mile was pretty pedestrian, a smooth five-ish minute mile on downhill road, fast enough to wake the body, but not too rapid to alarm my in-built pace-o-meter. I even stuck my head out front, albeit only for a handful of seconds! Once the climb began I slipped back gradually with the leaders pushing a pace I could definitely maintain, but not for twenty-two miles, and so I settled into rhythm, tucked in behind Team GB’s Jack Wood and William Neill. Knowing the enviable quality of those two, I was aware that if I could keep them in sight for the first ascent then they’d keep me close enough to the action. Upwards into the mist, cool air swirled and drew away the sweaty effort of continual ascent, the gradient steepened and more runners passed. I fought the sense that I was falling too far back but it was feeling a touch pedestrian and yet simultaneously strained, not the ideal combination, and even as I pushed a bit along a singletrack ridge, I could sense yet more runners at my heels. Entering the cobbles, the leaders came tearing past during the opening moments of their descent, they looked far more fluid and relaxed than I felt but despite my distinctly average efforts thus far, I was still only about six minutes off the lead, a lot, but not a completely different league. The summit was underwhelming, a damp gathering of marshals and a post to round before striding out on the slippery surface. I’ve learned my lesson many times over when transitioning from Alpine-length climbs directly into pounding descents, with numerous bouts of untimely cramp. This time I jogged into the early corners, allowing time for muscles to adjust whilst ‘enjoying’ the steep learning curve of sprinting over greasy cobbles, not a pleasant experience. As expected, my quads screamed from the start but I consoled myself with the fact that everyone was in the same boat. Passing Jeff and Niamh at the feed station I got my split times, six off the lead, two minutes behind a flying Eoin and a couple clear of Des, pretty much where I expected to be at this point on trail types not best suited to my abilities. I was pleased to spot Jack about fifty metres ahead on the one technical section and closed to within ten, but as we passed on to the smoother surface his giant strides carried him away again. Heading into town the leaders again passed, beginning their second ascent, and I was really pleased to see the ever-amiable Andy Wacker up at the business end, dictating the pace. Eoin was running magnificently, right in the mix and looking relaxed, a cheery shout and we went our separate ways, divided by about three minutes. I passed under the inflatable banner at around 1:28:00, ahead of my intended three-hour split pace and feeling okay, certainly not burned-out in any way, although I still had the nagging feeling that I was placed well outside the top forty and so behind previous results at this level. The second climb featured a very long, gradual-gradient forest road that seemed to stretch for a few miles. Although the lack of angle definitely didn’t suit my strengths I was in a solid rhythm, tempo heart rate and reeling in the Mexican, German and Austrian athletes who had been several hundred metres ahead. Slugging a caffeine gel, I was delighted when the stepped rock began, allowing my body to click into a powerful stride, dispatching my nearest opponents and rapidly bringing others into view. Even better, a glance upwards and a rare crack in the clouds revealed an imposing amphitheatre with no obvious line other than straight up through. For those suffering early exertions this was no doubt a kick in the teeth but that sense of growing energy was coursing into me, a combination of correct fuelling and sensible pace. The steeper it got, the better I felt, passing several others before it levelled out and we edged towards the feed station once more. A moment’s disorientation thinking it may already be the summit but a bemused Jeff put me right and it was back to the cobbles for the final push. This second ascent had a cruel and crushingly steep conclusion that had earlier dealt a killer blow to the gold medal prospects of the USA pair of Joseph Gray and the aforementioned Andy Wacker, and was now sucking the last reserves of those further down the field. Except for me, because my legs were still feeling the benefits of previous sensibility, the combination of maturity and experience enjoyed by us older folk seeing me right as I tapped out a smooth jog, edging another few places past the jerky rhythm, hand on thigh victims around me. I wished for another mile of this torture, spying USA’s David Sinclair and a Slovenian pair just beyond reach, tipping on to the negative gradients before I could reel them in. Unless those ahead were completely blown then this was a descent for consolidation rather than passing. I did pick up one place on the trickier bit, watching the feet of those around me sliding alarmingly, highlighting some interesting footwear choices. As usual, the World Champs were piggybacked on another established event, leaving us sharing the mountain with a thousand other athletes, and so at this point we were surrounded by slow-moving runners, many barely managing a quarter of my pace. It made for some interesting manoeuvres and the need for constant chatter to evade the litany of spiky pole ends and near-static competitors but it did allow me to hide from chasers, not wanting to give away places at this juncture. Cramp threatened mildly but not insistently and I was able to sprint to the end, crossing the line in 2:58:22 for 33rd place, my best World Champs result, and pleasingly far closer to the top ten than ever before. Post-race euphoria mixed with disappointment at not being half as hungry as I wanted when faced with yet another excessive spread. Jacuzzis, water slides, ice-rooms, saunas, prize-giving and then a very amusing piss-up in one of the two bizarre night clubs. Shiny happy people, some enhanced by the flush of success, others by the satisfaction of targets hit. Strong Polish spirits rejuvenated stiffened joints and the dance floor saw several miles added to the day’s tally until finally myself and the GB boys, the last men standing, were turfed out by stern looking staff for the short walk back to bedrooms and oblivion. A great night, a brilliant race and as ever, an overwhelming experience. So 33rd in the world, not bad. Eoin scored a stupendous 19th and Des, after a tough second lap ran in for a very respectable 62nd. 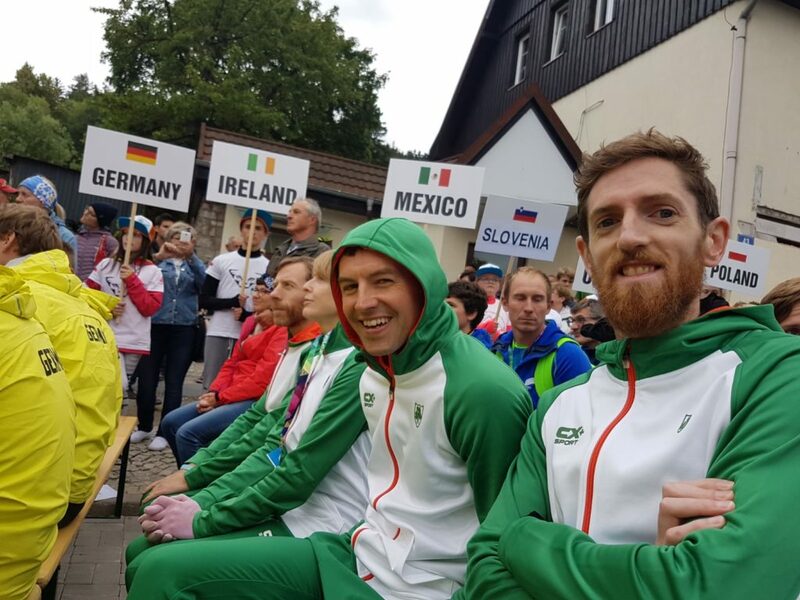 Best of all, for the first time ever, Team Ireland registered the required three finishers at the World Long Distance and secured a top ten overall team result. As mentioned, I was just eleven minutes outside the individual top-ten, a handful of per-cent in a three-hour race and certainly no insurmountable barrier. My small strides into a new decade meant slipping into the Vet 40 Category where i secured 4th spot, number four in the world, feels good to say! Although there is a separate Masters Worlds for us ‘more mature’ runners, and as competitive as that race is, I must admit to being more satisfied to be so highly ranked amongst the over forties still able to qualify for their national ‘Open’ squads. Interestingly, I also beat at least one athlete from every nation except Team USA and so could theoretically have been selected for almost any country. Overall I’m delighted; still improving, still enjoying, and still throwing dance floor shapes that the young-uns could only dream of (maybe!). So does life begin at forty? No! Of course not! I’ve been lucky enough to have an amazing time up until now, but fortunately as I enter my fifth decade, life hasn’t yet ended. I’m still competing, still improving but more importantly realising that results are less important than experiences. The desire to win is still strong but no longer all-encompassing, and that has to be healthy, and it’s all down to age and experience. As always, huge thanks to many people. Eoin and Des, fantastic teammates and Jeff and Niamh, perfect support. Particular thanks to those two for standing on a freezing mountain for hours, suffering crappy coffee, just to hand bottles to unresponsive runners. To WMRA for the hospitality and the LOC for a brilliant event. IMRA for the funding and organisation and Newcastle AC for chucking me fifty quid towards fuel. And to all the other athletes who provide inspiration, competition and barrels of craic, without them there would be no point. Hopefully more of the same next year although plenty of people have told me that my body will start to implode fairly soon, I really hope they’re wrong.